For other ships with the same name, see HMS Conqueror. HMS Conqueror (nickname "Conks") was a Churchill-class nuclear-powered fleet submarine that served in the Royal Navy from 1971 to 1990. She was built by Cammell Laird in Birkenhead (the only British nuclear fleet submarine not to be built at Barrow-in-Furness). 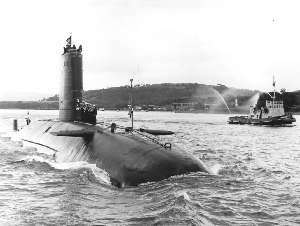 Conqueror was the third submarine of her class, following on from the earlier Churchill and Courageous. The submarines were designed to face the Soviet threat at sea by attacking other ships and submarines, and spying on Soviet nuclear-armed submarine movements. Conqueror, commanded by Commander Chris Wreford-Brown, was most famously deployed during the Falklands War, setting sail from Faslane Naval Base on the Gare Loch in Scotland on 3 April 1982, one day after the Argentine invasion. Conqueror arrived in the exclusion zone around the Falkland Islands 21 days later and was ordered to scan the area for Argentine shipping, particularly the aircraft carrier Veinticinco de Mayo ("25th of May"). On 30 April, she spotted the Argentine light cruiser General Belgrano sailing southwest of the Falklands, just outside the exclusion zone imposed by the British on all shipping. With Veinticinco de Mayo approaching the islands from the north, the commander of the British Taskforce, Admiral 'Sandy' Woodward, feared a pincer attack, with General Belgrano attacking from the south and Veinticinco de Mayo from the north and requested permission from the British government to sink General Belgrano. 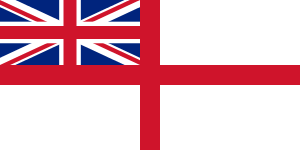 After some debate, permission to engage General Belgrano was sent to the submarine from the Royal Navy's fleet command centre in Northwood in the United Kingdom. In the intervening period, General Belgrano had retired from its attack position and turned west, since Veinticinco de Mayo was not yet ready to engage the British fleet. This later caused some controversy, although General Belgrano's captain and the Argentine government later acknowledged that the attack was a legitimate act of war. On 2 May Conqueror became the first nuclear-powered submarine to fire in anger, launching three Mark 8 torpedoes at General Belgrano,[note 2] two of which struck the ship and exploded. Twenty minutes later, the ship was sinking rapidly and was abandoned by her crew. General Belgrano was unable to issue a Mayday signal because of electrical failure; this and poor visibility meant the two escorting destroyers were unaware of the sinking until some hours later. A total of 323 men were killed. Adding to the confusion, the crew of the ARA Bouchard felt an impact that was possibly the third torpedo striking at the end of its run (an examination of the ship later showed an impact mark consistent with a torpedo). The two ships continued on their course westward and began dropping depth charges. By the time the ships realised that something had happened to General Belgrano, it was already dark and the weather had worsened, scattering the life rafts. Conqueror's war did not end there. The crew of the submarine had to face Argentine Air Force attempts to locate her in the days after the attack, which had shocked the Argentine people and ruling dictatorship. Conqueror did not fire again in anger throughout the war, but provided valuable help to the task force by using sophisticated monitoring equipment to track Argentine aircraft departing the mainland. After the war, Conqueror returned to Faslane, flying a Jolly Roger adorned with torpedoes, a customary act of Royal Navy submarines after a kill. When asked about the incident later, Commander Wreford-Brown responded, "The Royal Navy spent thirteen years preparing me for such an occasion. It would have been regarded as extremely dreary if I had fouled it up". Later in 1982, Conqueror completed a raid to acquire a Soviet sonar array from its Polish-flagged tow-boat. The operation, a joint mission between British and American forces, was conducted on the boundary of Soviet territorial waters. Conqueror used cutters affixed to her bow to shear through the three-inch thick wire before silently returning to her base on the Clyde. On 2 July 1988 Conqueror was involved in a collision with the Army Sail Training Association yacht Dalriada south of the Mull of Kintyre. The yacht sank and four crew members were rescued. HMS Warspite (left) and HMS Conqueror (centre) with HMS Valiant (at rear) at HMNB Devonport Navy Days, 26 August 2006. Conqueror did not take part in any other conflicts, and was decommissioned in 1990. The periscopes, captain's cabin and main control panel from the submarine's control room are on display in the Royal Navy Submarine Museum in Gosport. ↑ The only other submarine to sink a warship since World War II is the Pakistani Navy's PNS Hangor. ↑ Hastings, Max; Simon Jenkins (1983). "Chapter 9". The Battle for the Falklands. Bungay, Suffolk: Book Club Associates. p. 147. ↑ "Falklands Campaign Battle Honours". Hansard. 25 October 1983. Retrieved 5 September 2008. ↑ One Hundred Days: The Memoirs of the Falklands Battle Group Commander, Admiral Sandy Woodward. First Edition (1992). Naval Institute Press. ISBN 978-0-00-215723-0. ↑ Neil Tweedie (12 October 2012). "HMS Conqueror's biggest secret: a raid on Russia". The Daily Telegraph. London. Retrieved 28 August 2014. Rossiter, Mike (2007). Sink the Belgrano. Bantam Press. ISBN 978-0-593-05842-8.